How Do You Measure What's Really Important? | The girl who loved to write about life. Yesterday, we spent the afternoon on the rooftop, hanging out with Jack. We pulled some seats close to each other, wrapped Jack up in a blanket, and just soaked up the warmer weather. And it felt so, so important. We weren't doing anything that any to-do list would have classified as important. We weren't discussing our rank list for match (which is due in like two weeks, so expect the panic attack any day now), we weren't cleaning or studying or working or replying to emails or any of that other grownup stuff...we were just hanging out. We were enjoying warm sunshine and sipping cold drinks and looking up funny things on the internet and hanging out with our new babe and just being a family. And it was important. I needed to just sit there and do nothing. To enjoy the fresh air and relax with the love of my life. To take a few deep breaths and snuggle my little man in the sunshine. "As you move into 2016 hoping for a saner schedule that prioritizes your actual life and keeps you focused on the things that matter the most, let me share the decision-making filter my agent Curtis always gives me: "If it's not a HELL YES, then it's a no." So that medium yes, that I-feel-like-should yes, that guilty yes, that coerced yes, that I-actually-hate-this-thing yes, that I-guess-so yes, that who-else-will-do-it yes, that careless yes, that default yes, that resentful yes, that I-probably-shouldn't-but-struggle-with-boundaries yes? No thank you. I am unable to commit to that this year. Thank you so much for asking, but any new yes I give right now means a no to my family and sanity. I am so flattered you asked and count on my prayers, but I am at my maximum bandwidth right now. I appreciate your work so much, but I've already committed my time and energy this year. I've loved being a part of this, but I am no longer able to continue. We are aggressively focused on x, y, and z this year, so as a family we've agreed on no new commitments. This is what I can give but won't be able to do more right now. Now, the things that make your heart race, your blood pump, the fire in your belly burn, your gifts to leap to life, and keep your family and home healthy and strong...the hell yeses? ALL IN, BABY." Would it have made sense to anyone else if I had told them yesterday that sitting on a rooftop was the most important thing I did all day? Probably not. But that doesn't matter. Maybe it's becoming a mom, or maybe I'm just growing up and caring less what people think, but I've been thinking a lot about just how much we do because we feel like we should, like it's supposed to be important, and how much we miss out on because of it. So here's to saying no more often. To saying no to a mundane life that you just don't want, or to saying no to the life that has become too fast-paced for you. Here's to saying no to spending time with people just because you feel like you should. Here's to saying no to all the responsibilities you've taken on that aren't yours at all, you've just made yourself feel like they are. And here's to saying yes more. To saying yes to spending your time with your favorite people. To ordering pizza for dinner when you're too tired to cook. To going on spontaneous adventures and shutting the laptop off while you do so. To saying yes to the important things. Sometimes, the most important thing you will do with your day will be big and life-changing and you will remember it forever. And sometimes, the most important thing you will do is sit on a rooftop, doing nothing with the loves of your life. Only you know what's really important right now. And only you can say yes and no to the right things to make the important things happen. So do that! Wishing you a month full of no thank you's and many, many big, important, strong, passionate yeses. I love this! Saying no to things that aren't important is very underrated. I'm glad you got to enjoy the sunshine with your baby! We moved back to our home state after living in far more exciting places for this very reason. Time with family is more important to us now than anything else we could be out doing by ourselves. Once again, Chelsea, your words have come to me right when I needed them, THANK YOU! xo. Just yes to all of this. That was the most important thing you could've done yesterday. This resonates so well with me that last year. With having twins, I wanted to stay home more. To soak them up, to enjoy my family and sometimes to just relax because I was exhausted. You should enjoy your new family. Soak Jack in completely because they grow so fast and change quickly. I love that photo of you and Jack. You look completely and utterly happy!!! I love this! I need to learn to say no a bit more. Very well written, Chelsea! I'm SO with you. I have learned to say No a little more, and at first I felt really really bad about it. Family and my sanity comes first though, and I know that it's okay to say no more to say yes to the big things. You hit the nail on the head with this one. This post was just what I needed today-loved it! I so love this! Sometimes, it's necessary to just sit and soak... I'm learning this lol! becoming a mom helped me REALLY focus my priorities. I said goodbye to friendships that weren't mutually beneficial, because my time had become so much more precious. I said no to activities that didn't mean anything to me. I now had work, life, friends, husband AND baby to balance. and so if it didn't add a whole lot of good to my life, gone it went. but those friends and those things that did add to my full life even more? those became bigger parts of my life, and I was happy to spend my time on those. Love this! I totally agree, some nights when I'm like I should be doing this, this and this... I just end up sitting on the couch with my husband, chatting and snuggling... that's what's really important. The rest can wait. You're a beautiful mom and look absolutely fantastic! Jack is a cutie, I can't believe how little he is! I always forget how small babies are! Your rooftop hang sounds amazing, and I'm jealous you live in warm, sunny FL! And thanks for sharing that instagram post, I definitely needed those words right now as I'm trying to wrap up stuff at work before maternity leave! So true! Quality time with family is the most important thing. ah yes! i am learning to say no these days as well! there are events that people invite us to that benefit greyhounds (which i love supporting!) but if its too much money, too much time, etc it's just not worth it. there are other things we'd rather be doing like actually spending time with our greyhound or enjoying chatting with our dear friends over hot toddies. i love that rule - if it's not a hell yes, then it's a no. The rooftop outing - important to me! Family, rooftop, drinks, etc. my favorites! I wrote what Jen Hatmaker said in my journal. I love the idea of the Hell Yes! How amazing is this quote?! I love it and totally need to remember it -- I'm always so focused on crossing things off of my to do list. Looks like you three had a wonderful afternoon! I think what's important is what your life needs. If you just need some relax time on a rooftop then do it! If you need to up your sugar intake with a spoonful of Nutella then do it! ahh i love this and i couldn't agree more. while i like doing things and experiencing things most of my fondest memories are just of me hanging out or being around the people i love most. we weren't doing anything elaborate but it was absolutely perfect! Yes, yes, yes! Hell yes. Hahahaa. I love Jen Hatmaker and just finished her book For the Love. So, so good. Love all of this! sometimes you just need to do what you're not expecting to do, what you didn't plan to do but what makes you feel whole. Sometimes, that means drinks on a patio with the people you love the most. I saw that post, too and thought it was great! Cheers to more "special" yeses! Well this is a different view of new years' resolutions. Usually it's all about forcing yourself to do all the stuff you would rather not but you know are good for you, but this one just makes your future actions sound... enjoyable. Unfortunately I'm doing many things I'm a little iffy about, but maybe when I leave school and have the freedom of real life, maybe then I'll do more of everything I want and less of everything else. I think relaxing rooftop with your boys sounds just about perfect! I am with you girl. Seriously its all about saying no and taking care of myself first this year! Oh my goodness, I love this. Sometimes I feel so guilty when I take a break just to hang out and do nothing. But that time is SO necessary. So therapeutic. And I LOVE the idea of "if it's not a HELL YES it's a no." I would love to follow that philosophy! Reading this post was important :) Thank you for sharing. This is SO TRUE and something I'm learning as well. What is really important right now? Is finishing that blog post important? Is checking my phone important? Is cleaning the already pretty clean kitchen important? Sometimes the answer is yes, but usually what's more important is time with my family and time for me. Love it! Perfectly stated! Knowing our limits is crucial. Loved that you had a great day! So sweet, and so important. Thank you for sharing these wise words! excellent sentiment and something i need to do more often! i'm guilty of putting too much on my plate because i don't want to disappoint anyone. Great post! Taking time to do things you want to do without having to seek the approval of others is definitely important. 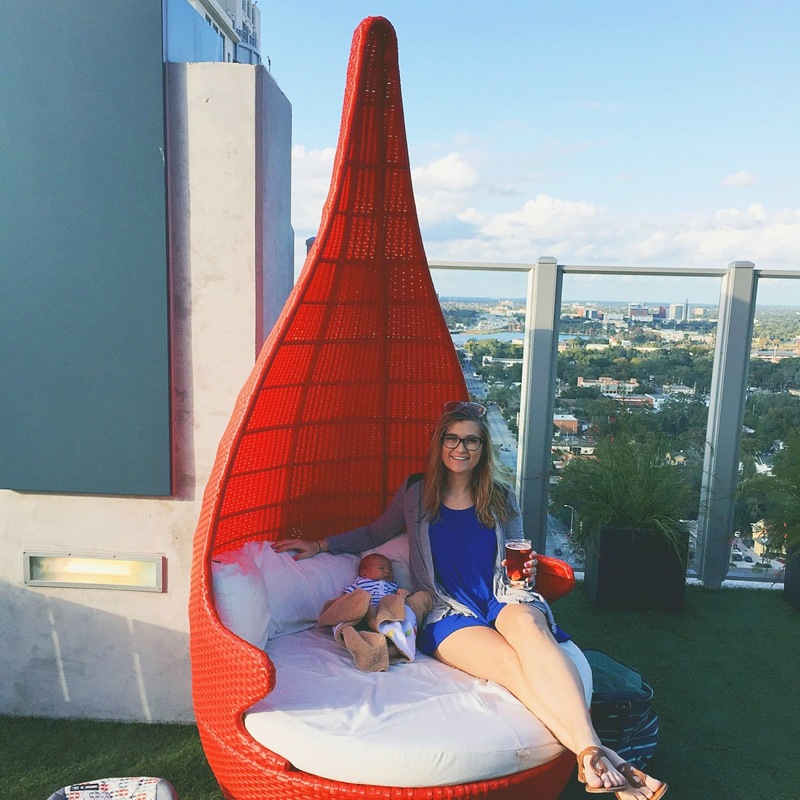 Rooftop hangouts with your family sound like fun! Your little guy is so cute! Definitely do what makes YOU happy! Say yes to you!